One of the most talented generation next actors, Yami Gautam has managed to make a mark for herself in the film industry. The actress who made her smashing debut with 'Vicky Donor' in 2012 has featured in many hit films ever since. And not just Hindi, Yami has acted in Telugu, Tamil, Kannada, Malayalam and Punjabi films as well. The gorgeous face started out from television with 'Chand Ke Paar Chalo', 'Raajkumar Aaryyan' and 'Yeh Pyar Na Hoga Kam' to name a few. She has featured in several hit films and has worked in A-lister actors in B-Town. Her last outing 'Kaabil' was a blockbuster hit at the Box Office. It starred Hrithik Roshan in the lead role. The actress has films such as 'Sanam Re', 'Badlapur' and 'Action Jackson' to her credit. Besides Shree Narayan Singh's 'Batti Gul Meter Chalu', Yami will be seen in 'Uri'. Yami enjoys a solid fan base on social media who love to follow the actress and are keen to get regular updates about her projects and interesting pictures. Yami recently walked the ramp for ace fashion designer Reynu Taandon at the India Couture Week 2018 in New Delhi. She dazzled on the ramp and turned many heads with her poised walk. On the professional front, she will be seen in 'Batti Gul Meter Chalu'. It features Shahid Kapoor and Shraddha Kapoor in the lead roles. The actress even chopped off her mane and is currently sporting a brand new hairstyle. The actress looked ravishing in a cream-gold lehenga. Her minimalistic make-up made her glitter in that gold attire. She even posed with the designer and was the showstopper at the show. Yami turned the showstopper for the designer and aced her ramp walk. The gorgeous actress looked stunning in the lehenga choli. 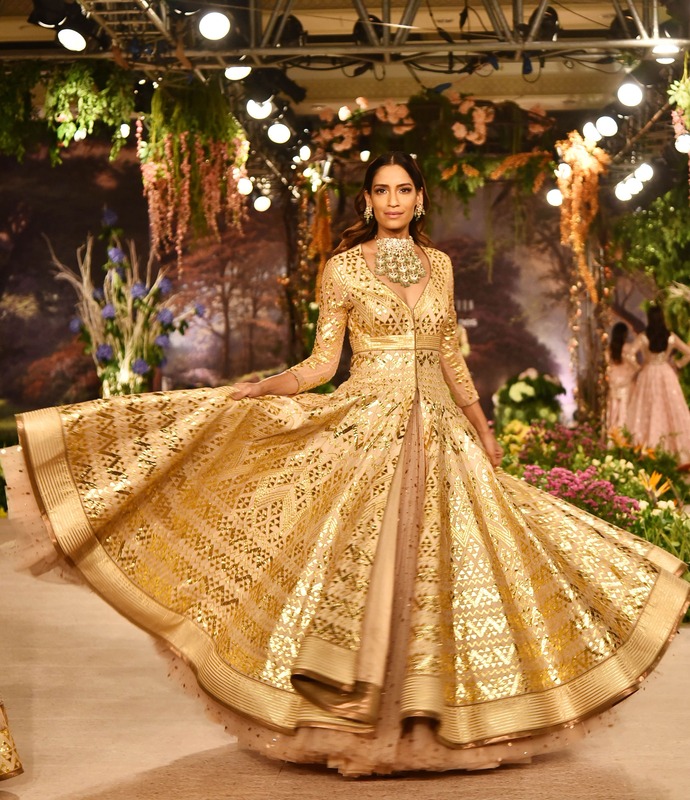 Her exquisite designs had a beautifully presented rich colour theme of gold and beige. The collection was majorly focussed on the younger brides. Several top models walked the ramp and the show was high on glamour. The designer's collection was titled ‘Once upon a dream’ rightly reflected the theme in her bridal couture. India Couture Week 2018 had some interesting line-up of designers. Reynu Tandon's work had intricate Indian designs on traditional attire. 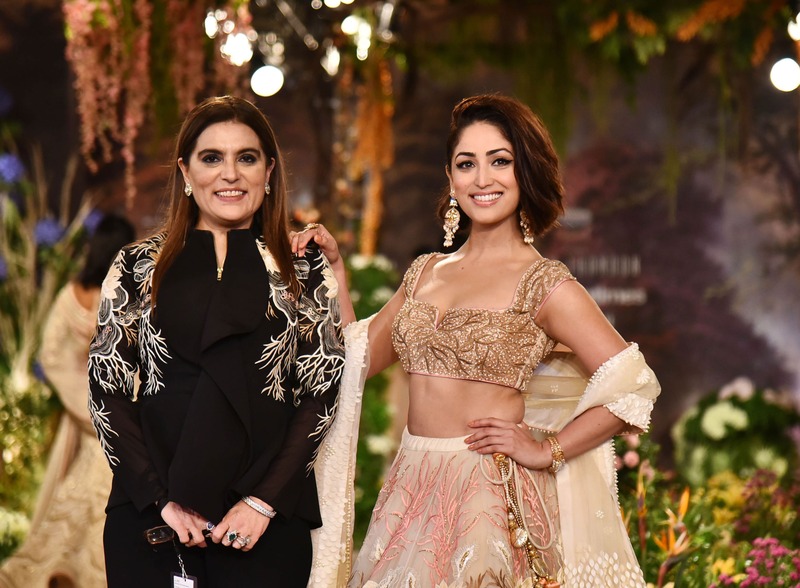 On the Day 4 of the fashion week, Bollywood celeb Yami Gautam graced the ramp.